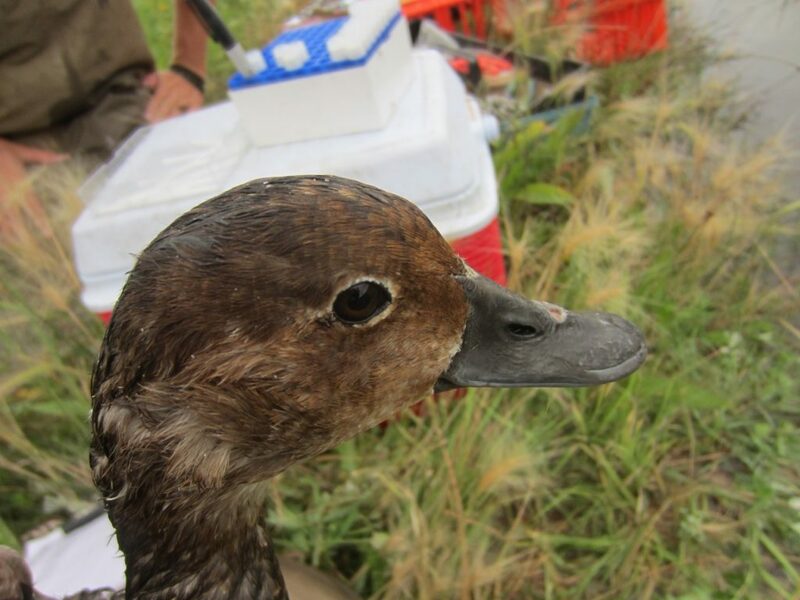 Wild ducks are thought to be a principal reservoir for avian influenza viruses (AIV). Avian influenza is a contagious viral infection that is common in birds and normally harmless to wild populations. However, these viruses have the ability to mix genes and create new viruses rapidly. This can lead to more virulent, highly pathogenic strains. Since 2005, the CWHC has coordinated a national surveillance program for avian influenza in wild bird populations. The program is a partnership with Environment and Climate Change Canada, the Canadian Food Inspection Agency, the Public Health Agency of Canada and provincial and territorial governments. The aim is to detect new strains of the virus and determine AIV prevalence. Wild bird AIV testing can act as an early warning system for outbreaks and is especially critical in regions where possible poultry losses could be great. Targeting dabbling ducks in Saskatchewan. In Saskatchewan, the Ministry of Agriculture supports the CWHC Western/Northern region’s ongoing efforts to monitor avian influenza in wild birds. The target is dabbling ducks such as mallards and blue-winged teal. These ducks feed on shallow vegetation and invertebrates and are thought to be more likely to be infected with the virus. However, the wire mesh traps are not selective. 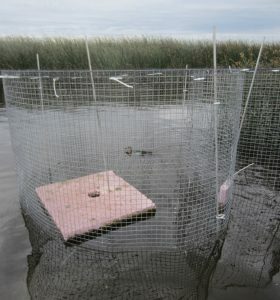 They are set in wetlands and baited with grain. 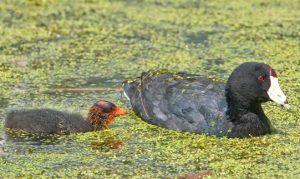 Coots are abundant in the traps as are diving ducks such as redheads and canvasbacks. All birds are given a standard metal leg band, swabbed to test for AIV and then released. CWHC students Collin and Brenna swabbing birds. 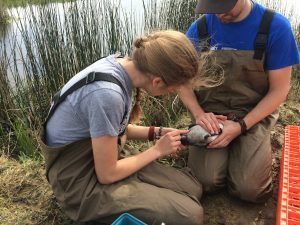 In the summer of 2015, the CWHC tested close to 800 birds in Saskatchewan and this year the total is nearing 500. The results of this work are available online at: http://www.cwhc-rcsf.ca/surveillance_data_aiv.php. The CWHC’s avian influenza portal is updated every two weeks to provide current information on AIV monitoring in both live and dead birds across the country. To stay informed please join our mailing list. To learn more watch this video of the 2015 wild bird AIV sampling.